First we thought that the below item had solved the mystery of the source of Shepard Fairey’s image of President Barack Obama that became an icon and is now in the permanent collection of the National Portrait Gallery. "Blogger Michael Cramer created the composite photo above after sifting through countless images to find a match. 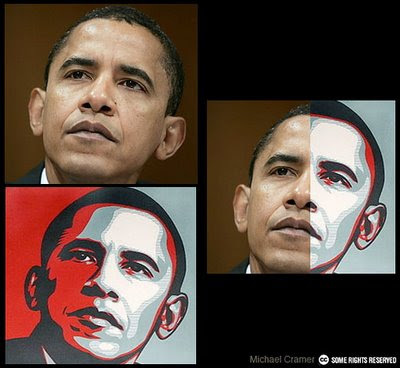 The poster has Obama facing the opposite direction; Cramer flipped it to correspond with the original source photo." Read the Reuter story here. However Philadelphia Inquirer photographer and blogger Tom Gralish then found another potential source discovered by Steve Simula here! And in the comments section of Simula's Flickr page, Cramer writes "You definitely found the right one. My match was close, but you got it spot on. Congrats." Good detective work by Simula. It gets better; after Simula identified the photograph (it was reproduced in this blog without any references so no one knew who the photographer was), the Inky's Tom Gralish began diggging around and he found that the original photograph was "made by freelance photographer Mannie Garcia who was on assignment for the AP in April of 2006." Details here. Good detective work by Gralish. Mannie Garcia is a DC-based photographer! So Mannie Garcia is the uncredited source for Fairey’s artwork now at the NPG. I think that Mannie's photograph should accompany the artwork and that the NPG should exhibit them side by side. And thus I hereby call for the National Portrait Gallery to acquire the original Mannie Garcia photograph. And kudos to Gralish and Simula. Update: Brian Sherwin, Senior Editor at MyArtSpace.co Blog has some words on how this whole issue relates to copyright and Orphan Works Legislation. Update 2: Mannie Garcia writes in his website: "The Danziger Gallery which represents the artistic works of Mr. Fairey contacted me on the 21st of January 2009 to inform me that my photograph was in fact the basis for the artwork that has become better known now as the “HOPE” and “PROGRESS” posters"
New Waves 2009 is the title of the exhibition of Virginia artists at the Contemporary Art Center of Virginia which says that "New Waves 2009 is an opportunity for CAC to support the work of Virginia artists by assisting them in garnering recognition from the public and nationally recognized galleries and collectors." The opening reception is from 7-9pm on Friday, January 23, 2009 and the New York and Atlanta gallery-owner jurors selected Susana Almuina, Clover Archer, Nicole Baumann, Stephanie Bingham, Mikael Elliot Broth, Travis Childers, RJ Clark, Derek Cote, davmo, Miriam Ellen Ewers, Peter Geiger, Kirsten Kindler, Lisa McCarty, Megan Mueller, Michael Ohgren, Kristen Rego, and Rainham D.M.H. Rowe. Because from of all those names I recognize only two (and I think that I have a pretty good handle on a lot of Virginia artists) I am really curious as to whom the jurors selected. 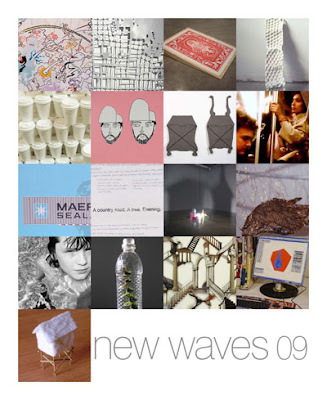 In fact, I'm going to visit this show and see what the works looks like. As outsiders, the two jurors would have brought in a couple of fresh, unprejudiced eyes to the selection process, rather than a priori knowledge to the process. I'm a little surprised in that I think that this is a good thing. In fact, the more that I think about it, the more that I think that other jurying processes or award processes that are regional in nature, should employ as jurors qualified outsiders who look only at the work and its visual and collective merit, rather than "recognize" the work and thus the artist and thus bring in immediate opinions and prejudices to the contest. The drawback would be when an outsider fails to recognize a copycat artist. In the card below I see at least someone channeling Dan Steinhilber and half a dozen Art0matic artists of the past. But I think that the gains from clear, unprejudiced eyes, outweigh the occasional copycat from getting into the list. It could even be a case of remarkable confluence. The reason that I have been able to predict a lot of direct hits at such major regional awards such as the Trawick Prize is because that very prestigious award employs local jurors for their process, and so far it has been my impression that many, not all, of the jurors bring in too much knowledge, and too close a relationship in a few cases, with some of the award winners. It would be interesting to see the Trawick employ three jurors this year from other neighboring states, rather than a Virginia, Maryland and DC juror. In fact, they could switch off every year. One year DC, MD and VA jurors; the next year other states, and so on. I bet that more interesting results would come out, instead of the usual suspects getting the award almost every year.